We get it – the end of the year is a crazy time filled with family, holidays, excitement, and, of course, annual giving campaigns. Not surprisingly, the end of the year is one of the busiest times for nonprofit teams as donors come out of the woodwork during the season of giving. In fact, 28% of nonprofits raise between 26-50% of their annual funds from their year-end ask! For nonprofit fundraising teams, it can seem like an uphill battle to wade through all the other end-of-year noise to try to raise donations for a charity or organization. 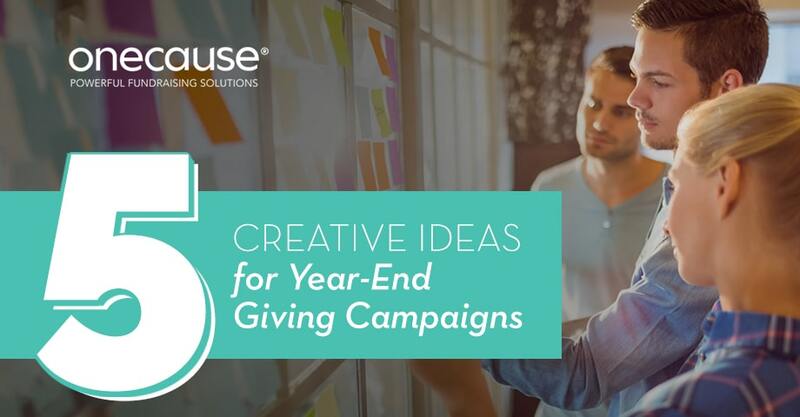 To make year-end easy, OneCause has put together a list of 5 creative end-of-year giving campaign ideas to help your nonprofit team execute successful, repeatable campaigns during the busy giving season. Before your end-of-year campaigns can start in earnest, you nonprofit has to let donors know it’s time to get involved. Instead of sending another batch email or leaving a stale voicemail on a machine, throw it back to the heyday of marketing with a tried and true direct mail piece. Whether you send a quick note, an invitation, or even a package in the mail, reaching your donor base is a necessary step to share your end-of-year campaign goals and generate interest prior to the appeal. Sending a personalized or handwritten note can appeal directly to donor emotions. This is a great time to share a personal anecdote if you know the donor personally or remind them why they are connected with your organization in the first place by recapping your mission. It also shows your donors a personal, human side of charitable giving that can get lost in the hubbub of the holiday season. If your base is too large to get that personal, consider highlighting several donors by including heartfelt “why I give” stories. At the heart of end-of-year giving lies a single day to rule them all – #GivingTuesday. This day falls right after Cyber Monday and is one of the largest days for charitable giving in the year. The trick to #GivingTuesday is to attract the right donors with the right message, all while every other charitable organization is trying to do the same thing. Just make sure you have a dedicated #GivingTuesday landing page with details, background, and a tool for taking donations. Online donation forms, giving pages, microsites, and, Text2Give, or Peer-to-Peer solutions can maximize #GivingTuesday donations. Make sure your donors know how to access your fundraising tools and how to connect with your team if there are any questions or issues. If your team isn’t sure where to start with #GivingTuesday, then research, research, research. There is a ton of great literature and ready-made resources to help attract donors on one of the busiest giving days of the year. Plan your #GivingTuesday well in advance to keep the momentum going even after the campaign is over. In today’s age of social media, everyone is well connected. With a peer-to-peer fundraising campaign, your team can take advantage of these networks to help drive donations towards the end of the year. From gamification contests that take place during the week of Thanksgiving to online leaderboards counting down to the end of the year, peer-to-peer fundraising makes year-end giving a fun, social activity meant to be shared with others. Want to take your fundraising to the next level? 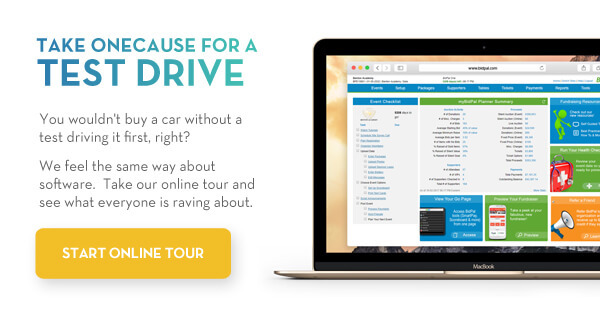 Empower your donors with peer-to-peer campaigns to make it easy for supporters to drive donations from wherever they are. Another way to creatively wade through the end-of-year giving noise is to run a holiday-themed social media campaign. These types of campaigns are great for engaging donors as well as attracting new followers who might not have heard of your organization or the importance of your cause before. Create a campaign-specific landing page and have donors share a custom #hashtag with their networks as a way to inform and engage others who may be interested in the cause(Bonus points if there is a festive element to your campaign, such as holiday hats or winter scenery)! Also keep in mind the power of video. By utilizing videos on social media, the visual messaging combined with the power and reach of social makes for a powerful end-of-year message. These videos can be short and don’t need to be professional (in fact, raw videos taken on a phone work just fine). We saved the most fun for last! The end of the year is a great time to bring all your donors and supporters together in a room to say thanks, have fun, and spread some holiday cheer. Typically end-of-year fundraising events are dressier affairs, whether they’re galas or silent auctions, but the general rule of thumb is to appeal to your donors and to thank your volunteers by hosting celebration events (don’t worry – these events don’t need to be fancy!). For example, the end of the year could be a great time for a hot chocolate peer-to-peer run/walk or 5k to set yourself apart from similar organizations. Just make sure you’re using the right tools or your fabulous end-of-year party could turn into a fabulous headache.